I’ve been bitten by the Yamaha bug. Bad. Here is my Super Flighter’s new big brother. Last weekend I had the best day. THE BEST. In the morning I visited VASE Amplification HQ. I’d been meaning to do this for ages as I was really keen on meeting Harry, who has resurrected VASE and recreated the iconic VASE Trendsetter 60 Deluxe beautifully. Also,when I got home from the trip… my son started walking for the first time, which blew my mind. So yep… great day! One guitar in particular really got my interest. The golden yellow guitar on the top right. It was the rare Martyn Booth designed Yamaha Image, a guitar I’d read a lot about over the years but had never seen in person. 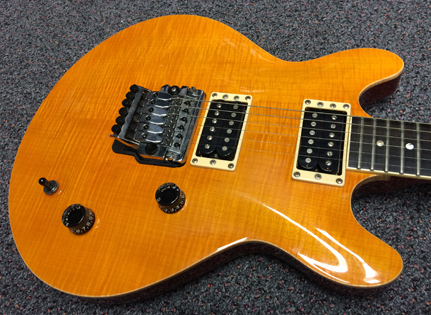 Martyn Booth was an ex-Gibson luthier who developed this 335/Les Paul hybrid for Yamaha in the late 80′s. They were very highly regarded, but Yamaha dropped the model after a few years. Martyn then set up his own shop and now makes a refined version of this design. It turns out Harry actually had three of these mythical beasts. The two on the outside are the Image Standards, while the beauty in the centre was the Image Deluxe. 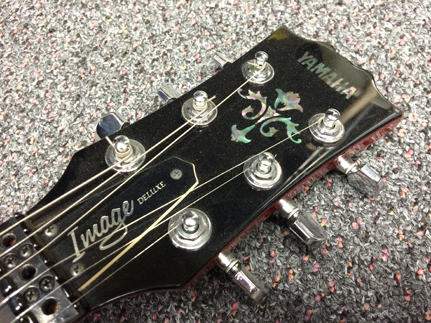 There was also another model called the Image Custom, but they’re even more rare and have a weird active pickup system. The red Standard is Harry’s personal guitar and is fitted with EMG’s. When I picked it up, the two things I noticed was that it was beautifully light and the neck was super slim. 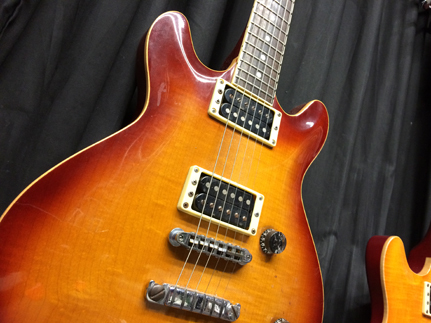 It reminded me of a Gibson SG, but a lot more refined. 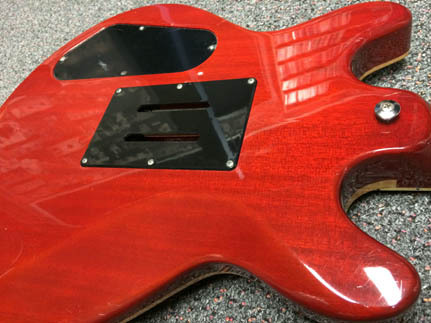 The cherry sunburst was a little heavier but had the same slim neck. The fretboard on the Standards is rosewood, while the Deluxe is silky smooth ebony. The Standard had a nice grain, with slight figuring. 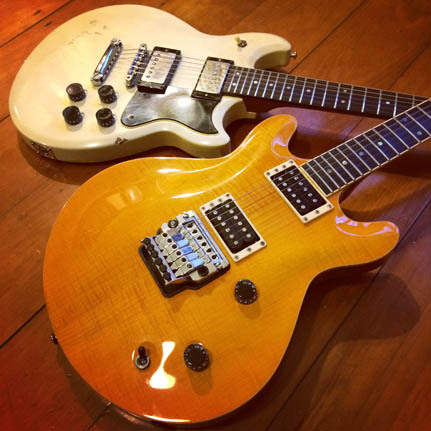 It had Yamaha’s typical flawless workmanship and in general it was a fantastic guitar. 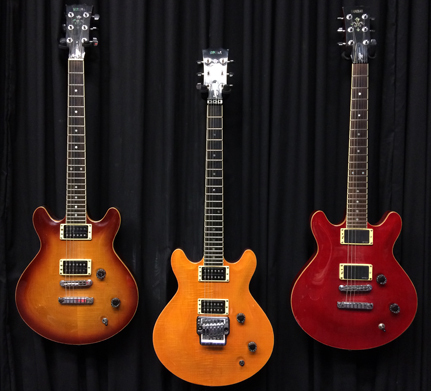 I know I keep saying this about Yamaha’s… but it’s a Gibson killer. The one that really caught my eye was the Deluxe. One look at that flame maple top and I was in love. With the cream pickup surrounds, ‘fake’ binding and recessed tone & volume knobs it has a definite PRS vibe. This Yamaha is just pure class. Unlike all my rock pig guitars, this was a guitar built to make the player actually play BETTER. The neck was a little wider and fatter than the Standards, but the jumbo frets and the super slick ebony fretboard mean that I can fly over this thing. Just a beautiful, beautiful guitar. The back is the typical mahogany stained a nice cherry red. Unlike Gibson’s, this has a nice rib carve and feels very comfortable. The neck join has been smoothed ever so slightly so that the sharp corners that Gibson likes to leave aren’t there. You can play right up to the 22nd fret. Not that I do… I haven’t a clue what to do up there. The body isn’t too wide, which for a little guy like me is great. Nothing worse than playing a guitar bigger than me. I look short enough as it is. 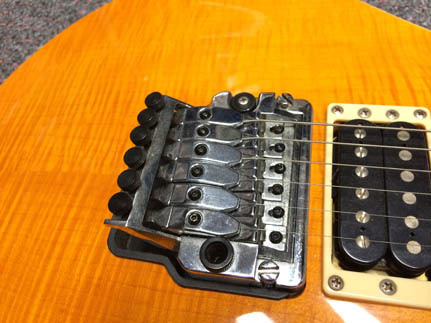 The bridge is Yamaha’s version of the Floyd Rose. Normally this would be a deal breaker, but the rest of the guitar is such class that I can live with it. In fact, in the last few years I’ve come back to the Floyd… probably due to the amount of Metal I’ve been listening to. In this case, all it means is that the Bigsby-like wobbles that I enjoy doing will now stay in tune! Which is handy. 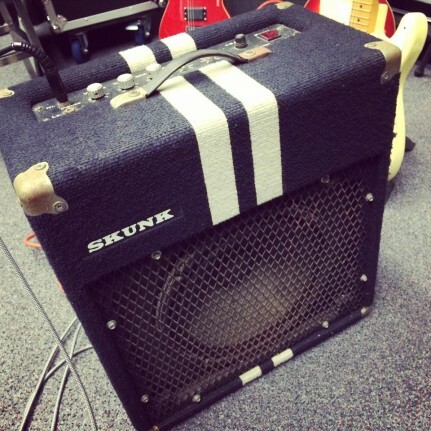 I first plugged it into a furry carpeted solid state amp called a Skunk. I’d seen a few of these around Brisbane over the years and just wrote them off as a typical cheap student/practice amp with a funny name. I was blown away to find out that Harry made these himself in the 70′s and they were made in Brisbane! And I was even more blown away when I plugged it in. This thing rocks! I think I need to track down one. I then plugged into Harry’s masterpiece, which was the reissued Vase Trendsetter 60 Deluxe. I’d played one years ago when they first got reissued but didn’t really get a chance to fully explore it. To my ears… it’s a cross between a Vox AC30 (that sweet chime & sparkle) and a Marshall JMP (the grunt)…. which is the magical Hot Snakes combo and so for me a total winner. And the tube vibrato/tremolo is just… I don’t know how to explain it… warm thick syrup. This video was shot on an iphone so doesn’t do the sound of this amp (and guitar) justice. It’s a great, great amp. And made in Brisbane! The pickups on the Deluxe are Yamaha’s own and have a great PAF flavour, but I don’t know if it was the VASE… they sounded really hi-fi. You could hear everything. They’re also splittable by using the push-push tone knob (which I’d never seen before) and they sound great. It’s a guitar that would easily fit into my soul rock band The Horrortones and then straight away could rock out with my rock’n roll band The Arcolas. This guitar can do it all. If I played Jazz, it could probably do that as well. But I can’t. So it won’t. Harry saw how much I loved the Deluxe, so he gave me a great deal which I was super stoked about. He said he’d rather it go to someone who would play it rather than a Yamaha collector. I’m over the moon. Between this and my Super Flighter, my Gibson playing days may be numbered. Maybe. Possibly. Probably. A big thanks to Harry and Carol and especially Greg GBass for organising the day. The level of enthusiasm these three have for VASE is inspiring. It’s such a great feeling to know that this Brisbane icon is alive and well again. awesome tony! been trying to score a deluxe for the longest time but no luck. please give me a heads up if you plan to sell yours. thank you. Thanks for the article. I also have the image deluxe. I bought it when nearly over 20 years ago. It has always been special to me. It was my first electric. I remember the second I saw it in the store. Even without playing it I knew that was the one I wanted. I have made no alterations to it. 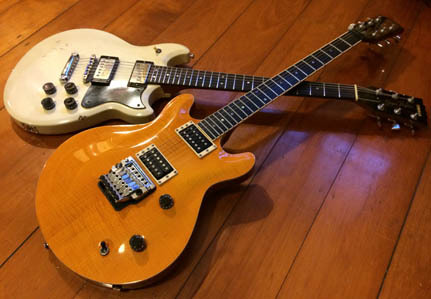 But, recently, I’m thinking about changing out the pickups. Any thoughts on what may sound good with it. 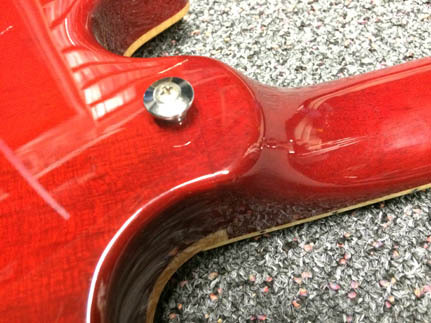 Also, I noticed that the pickups are not soldered in the traditional way. It has a circuit board and the pickups are connected to some kind of quick connectors. Have you messed with these? Are they hard to switch out? Hi , i have just noticed this forum. I’m obviously 2-3 years late, so im not expecting any real reply. 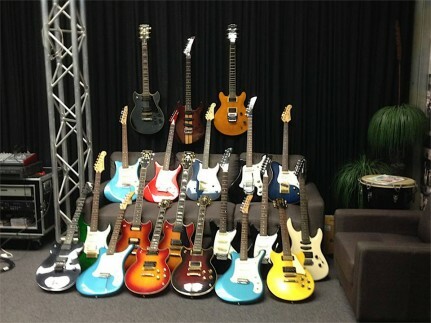 Just to let anyone know who is interested, I have 4 Yamaha MSG guitars, all in immaculate condition. 1 standard / 1 Deuxe / 2 Customs.